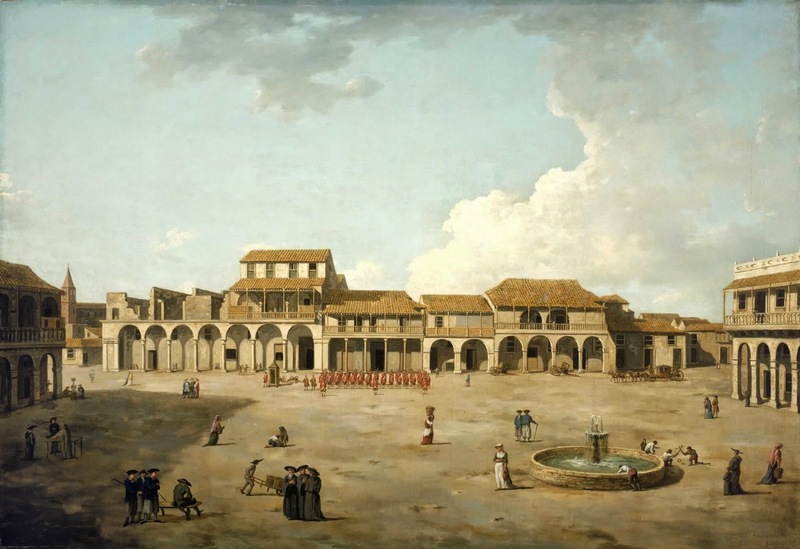 The Piazza at Havana, Dominic Serres, c.1762, National Maritime Museum. Special thanks to our reader Eric Bloomquist for pointing out this painting! To celebrate the capture of Havana during the Seven Years War, Dominic Serres did a series of paintings illustrating the distant land for the British people. This scene features one of the squares of that city with its locals dotting the scene and going about their business. Keeping a watchful eye over the populace is a line of regular soldiers and a few scattered tars. Standing beside a bench in the left foreground are a few Jacks in identical slop clothes. They wear blue short jackets, cocked hats with the point forward, slops, and white neckcloths. At least two of them carry sticks. These seamen from the center right mid-ground are dressed the same as their mates in the foreground. The major difference is the tarpawlin on the right, who has his back turned to us revealing that his jacket has no vents.